About I year ago I was attending a sewing workshop and I got to talking with one of the participants. I started telling her of my plans regarding cutting, sewing, and my sweater knit fabrics. The woman, who worked with textiles at a major museum here in the city, said she thought I could be successful in my enterprise, but she had misgivings about all the waste produced by the cut and sew method. 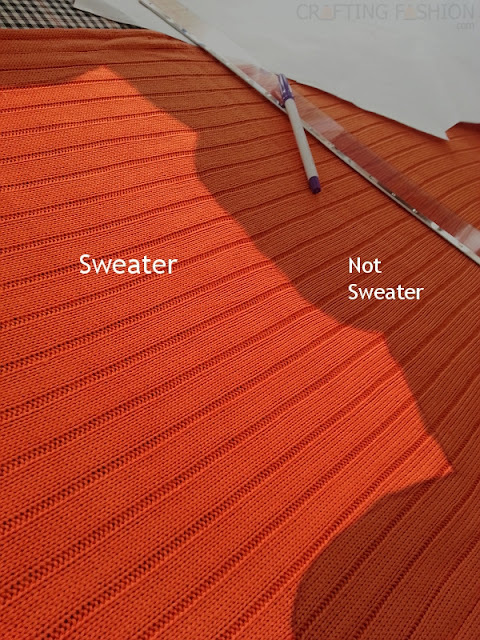 Indeed, there is waste produced with the cut and sew method where one starts with a piece a fabric and then cuts away everything that is "Not Sweater". And it's true that creating a fully fashioned garment creates no waste. Each inch of yarn goes into creating a fully fashioned garment. Nothing is cut away. But it's not as if I'm throwing my scraps away! My scraps serve many purposes. My large scraps are saved and cherished. One day they will be part of a big patchwork afghan. I will artfully piece the scraps together, perhaps with a flatlock stitch and yarn in the loopers. I'll use large rectangular pieces of knitted fabric as a backing. My smaller scraps have a very important job. They serve as experimental subjects. ;) This is how I'm sure most of us test stitch size, make differential feed adjustments, and check tensions. This is where we experiment with seams and various edge finishes. The results that I like get saved with my notes. Some of these "scraps" end up in photos on this blog. Those I don't like get tossed in the bin. What's inside the bin will be the stuffing for pillows I start the day after I finish my patchwork afghan. Or maybe sooner. Yes, I suppose they may seem like extravagant scraps, as I do like working with merino. But these scraps are few; it will take a long time to accumulate enough to stuff a pillow. They will have served me very well. I was doing some research for this post, because I was planning to include a couple of links to "zero waste fashion". This is where the designer cuts the garment in a way that there are no scraps. Some of these cuts can be very clever and make striking fashion. Others are just silly with excessive fabric added to the garment -- in the name of fashion or just so that it all gets used!? Many of these designers have gotten considerable press lately. Then I found this discussion from about 2 years ago on Artisan's Square. The links I had found and several more are included in the original post. The discussion that followed made me smile. There have been updates to the Knit Fabric Glossary: wale and knit, (Thanks for the suggestions, Andrea!) I've also added weft knit and warp knit fabrics. Take a look! Yea for updates to the glossary, and thanks for the shout out! I can't wait to see your "scrap projects" one day.